If you're already using Lightroom to organize and process your photos and videos from other cameras, you might be wondering whether you can use it with files from a GoPro. The functionality in working with GoPro videos in Lightroom is pretty limited, but that's an issue related to any video files, not just those from a GoPro. Lightroom's video support is mostly related to organizing the files and, to some extent, basic playback. It doesn't have nearly the same kinds of editing controls that it has for still images. But when working with photos from a GoPro, you have access to the full power of Lightroom, including its digital asset management features as well as its image editing. That's especially true if you're using the RAW photo format that some of the newer models have. You can edit and process photos from a GoPro just like you would photos from any other camera. That includes applying photo sharpening and enhancing the colors. There are also some useful things you can do in Lightroom that are particularly relevant to GoPro photos. For instance, you can use lens profile corrections to correct for the fisheye lens distortion of the wide field of view as well as mimic the linear FOV with .gpr files. For the most part, working with GoPro photos and videos in Lightroom is the same as working with any other compatible media files. But there is one quirk you might run across. This isn't actually a problem, because those files aren't necessary for what you want to do. So you can safely ignore it and click OK.
For each of these THM and LRV files, there is an original MP4 file. And it's that MP4 that you want. The LRV and THM files are derivative files and aren't necessary for what you want to do. They're used mainly by the GoPro mobile app and the camera itself to display a lighter-weight video proxy that doesn't use as much processing power or wireless bandwidth to display. I have a more detailed explanation of what LRV and THM files are here. 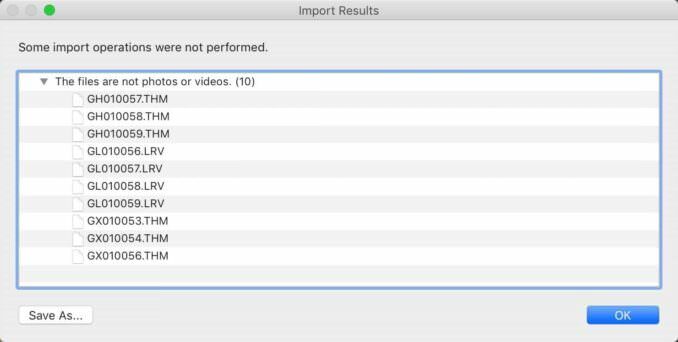 One area, though, where Lightroom isn't all that good is in its support for video files. It can ingest and organize them, and it can play them back, but it doesn't play high-resolution files back very smoothly or effectively. For that, a better alternative is actually the operating system's own video preview functionality or a more specialized playback app like Fileloupe.